Is your windshield cracked or chipped? Then you’re probably considering replacing your auto glass. But that may not be necessary. Thanks to advances in auto technology, mechanics can now repair windshields that previously would have been discarded or considered worthless. That’s why we’ve put together this quick guide for 4 things to consider before you replace that cracked auto glass! 1. Are you dealing with a chip or a crack? First, you have to identify whether or not your windshield is cracked or chipped. If there is just a small chip or other minor damage to your windshield, opting for a repair rather than a windshield replacement is perfectly fine. However, if you were in a major accident and substantial damage was done to your windshield, your safest and best choice is to just have it replaced. – Can the damage be covered entirely by a single dollar bill? – Does your windshield have more than 3 chips on it? – Is the damage to your windshield located near its edge? – Is your line of sight obstructed by the damage? 2. How bad does the chip in your glass look? If it looks bad, it probably is. In fact, several studies have shown that 80%+ of chips on windshields turn into sizeable cracks over time. Some of these large cracks will appear suddenly, potentially putting you in danger while you’re driving. 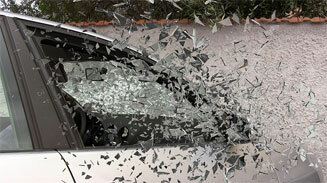 Similar studies have shown that cracked and chipped windshields increase your chance of an auto accident by 60% – 70%. Keep that in mind when you’re considering whether to repair or replace your windshield. 3. Is windshield repair a safe alternative to windshield replacement? Absolutely – as long as you go to the right place. One of the benefits to repairing rather than replacing chipped and cracked windshields is that you keep the factory seal unbroken. The repairs are often quite quick, and can ultimately save you a lot of time and money. This quick fix is done by using a vacuum to remove all moisture and air from the damaged surface. The resin is applied and set with a UV light. However, make sure you got to an auto glass mechanic that you trust, as not all places use the same processes or offer the same training. You want to go with a professional who really knows their way around a windshield. This concern comes from older generations. It used to be a valid concern, too. However, as technology and understanding in the field have progressed, it has become a safer and more trusted practice to replace windshields. Again, not all shops do the same great work. But if you go with someone you trust, you don’t have to worry. Now that you know a little more about the benefits of both windshield repairs and replacements, you can make a better choice for your vehicle. If your windshield cracked just a little, or if that chipped windshield has 3 or fewer chips, you may not need to pay for a full replacement. But if that chipped windshield looks like a starry night with shooting star cracks as accent pieces, you might want to pay up to stay safe!